The Second Judicial District Commission on Judicial Performance, on a vote of 10-0, recommends that Judge A. Bruce Jones BE RETAINED. Judge Jones was appointed to the Denver District Court in December 2010. Prior to his appointment to the bench, Judge Jones was in private practice, specializing in civil litigation and appellate practice. Judge Jones received his bachelor’s degree from Texas A&M University in 1978, and a law degree from the University of Texas School of Law in 1981. Judge Jones continues to be active in the legal community. He teaches a practicum at the University of Denver Sturm College of Law, and he believes that community service is important. Since his appointment, Judge Jones has served in both the domestic division and the civil division and is currently in the criminal division. The Commission reviewed survey results of attorneys and non-attorneys who have appeared in his courtroom, as well as appellate court judges. The Commission also conducted a personal interview with the judge, reviewed his self-evaluation and the submission of three written opinions authored by Judge Jones and an Opinion by the Court of Appeals. Selected members of the Commission observed Judge Jones in court. Of all attorneys surveyed about retention, 90% recommended to retain, 2% not to retain, and 7% expressed no opinion. Of the non-attorneys surveyed, 89% recommended to retain, 8% not to retain, and 3% expressed no opinion. The Commission was impressed with Judge Jones’ overall ratings and the positive comments by both attorneys and non-attorneys that have appeared in his courtroom. He is described as having an excellent courtroom demeanor and he receives high marks for his application and knowledge of the law. 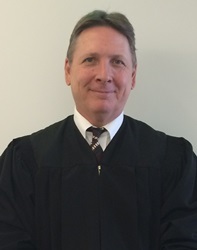 Judge Jones’ overall combined average ratings by attorneys exceeded the average combined rating of all district court judges standing for retention, and his overall combined average ratings by appellate judges and non-attorneys was slightly below the average combined rating of all district court judges standing for retention. It should be noted that the sample size for the appellate judges was very small.